KICK OFF COCKTAIL RECEPTION and MAIN CAST LUNCHEON Tickets On Sale! Katrina Rasbold, Webmaster January 15, 2013 January 26, 2013 4 Comments on KICK OFF COCKTAIL RECEPTION and MAIN CAST LUNCHEON Tickets On Sale! The GH Fan Club is proud to announce that tickets are on sale for the GHFC Cocktail Kick Off Event & for the Main Cast Event! To order your tickets, click on the link below that says “TICKET ORDERS.” Print out the ticket order form (it is a .pdf file), follow the instructions on the form very carefully, and mail it to the address listed. Only money orders are accepted for payment and they should be made out to Debbie Morris. Ticket orders will be processed in the order they are received by the GHFC (not by when they are postmarked). You may use one money order to pay for both the Kick Off Cocktail Reception and the Main Cast Luncheon, but please fill out a form for each. Both of these events are sponsored by the GH Fan Club. Again, tickets are on sale to the public! 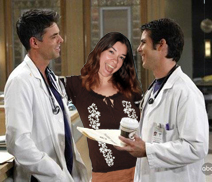 Welcome to my first prescription for General Hospital of 2013! These two weeks have surprised me with unexpectedly hot love scenes and curveballs regarding who was most injured in the crash. Sorry, Trey. Most surprising for me, however, was that Connie showed signs of a conscience … and I cared. “Significant Others” – When a powerful divorce attorney who only represented women is murdered, Castle and Beckett are confronted with a plethora of angry ex-husbands, any one of whom could be the murderer. Meanwhile, Castle’s ex-wife (Darby Stanchfield, “Scandal,” as Meredith) moves into the loft to take care of Alexis while she recovers from Mono, and to make matters worse, Beckett is also forced to move in while her apartment is being fumigated, causing tension, humor and more than a little awkwardness, on “Castle,” MONDAY, JANUARY 7 (10:00-11:00 p.m., ET) on ABC. Also, Jack Wagner (“Melrose Place”) guest stars as a pro golfer whose career went down in flames after a nasty divorce scandal, and Nancy Lee Grahn (“General Hospital”) guests as a wealthy divorcee caught in a “War of the Roses”-like struggle with her ex-husband. In the space of one week, we’ve had significant screen time devoted to two possibly returning characters: Lorenzo Alcazar and Lucy Coe. I am mildly interested in the return of Lorenzo, but teasing Lucy Coe and the Nurses’ Ball is like sprinkling catnip all over my favorite fake mouse. If I were a cat, that is. Perhaps the clearer description would be to declare that I’ll put up with Sabrina for it. 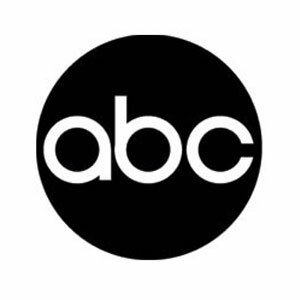 Fans of ABC’s hit drama “General Hospital” will be able to submit questions (#askgh) and receive real-time responses from fan favorite Ian Buchanan @KilttripUSA (“Duke Lavery” and a masked “Cesar Faison”) who will be up on Twitter during the East Coast broadcast of the show on THURSDAY, DECEMBER 6TH from 2:00-3:00 p.m. ET/11:00-noon PT. In tomorrow’s episode, Faison must figure out how to prove to Anna (Finola Hughes) that he and Duke are two different people. He comes up with a plan but back in Port Charles, Robert Scorpio (Tristan Rogers) is trying to convince the police what he has discovered about Duke’s true identity. The clock is ticking. Rebecca Herbst is the Official Ambassador for the Season of Smiles Campaign! Debbie Morris, President December 3, 2012 December 3, 2012 Comments Off on Rebecca Herbst is the Official Ambassador for the Season of Smiles Campaign! If you would like to help us spread the word – below is a twitter & facebook link. Here’s a great holiday gift and a way you can help the National Wildlife Federation. 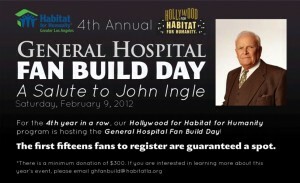 Want to meet General Hospital star Lynn Herring Northop? She’s auctioning a tour of her museum in California and two signed General Hospital scripts to benefit the National Wildlife Federation California. She is a great member of NWF’s California Advisory Council and we thank her for this donation. Bid soon! Auction closes on December 5th. The last two weeks featured the introduction of Lila Rae Alcazar, the death of Edward Quartermaine, and the returns of Ned Ashton, Skye Chandler, and Robert Scorpio. But I think I should begin with something of great significance. Something I never thought would happen and actually dreaded should it occur. I’m talking, of course, of Dante’s haircut.